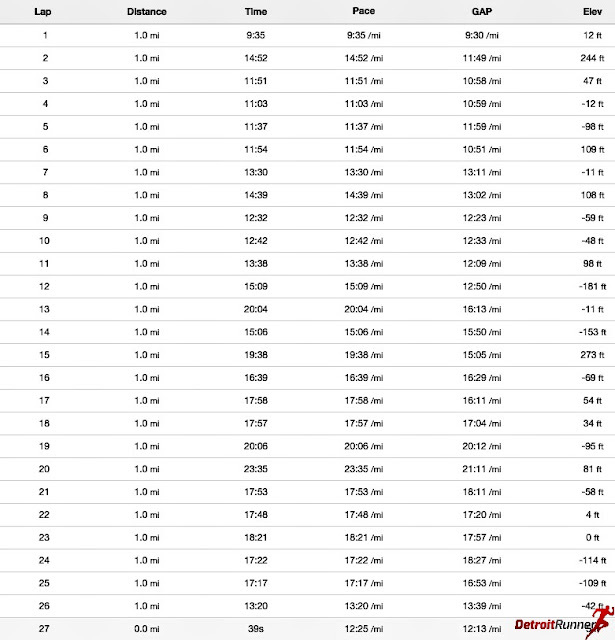 Finished in 6:46:49 (official time); no new PR, a personal Worst! 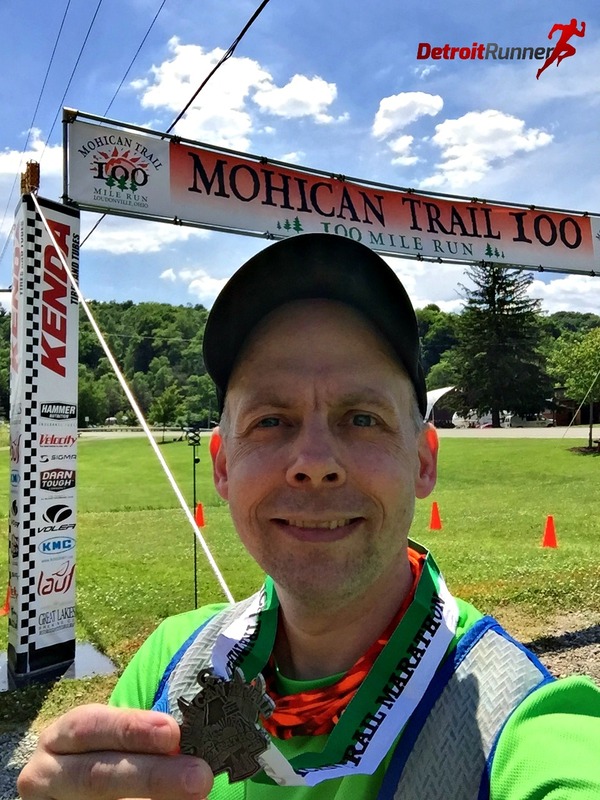 Great trail marathon in Ohio. It was a really hot one though so I ended with a personal worst, walking half the course and running out of water even! 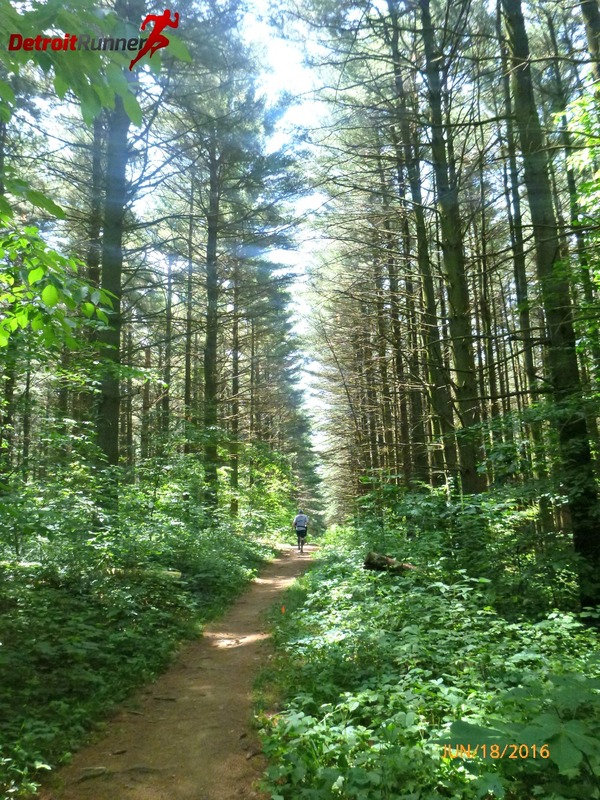 The trails are beautiful and worth a trip to run this and have a nice camping vacation. 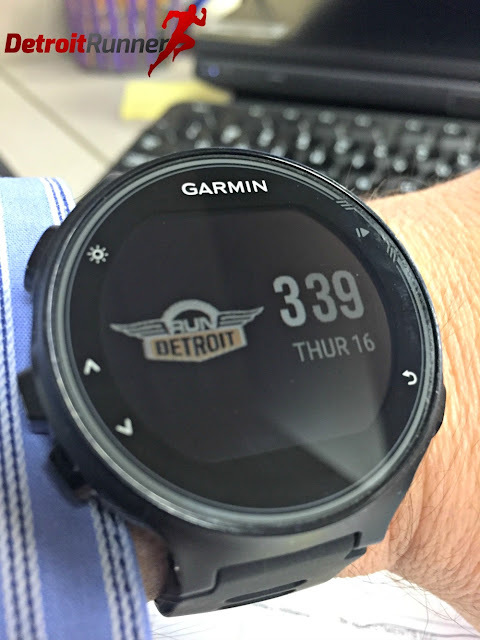 I decided to rent a Garmin 735 through Rundetroit's Garmin program to test it out. What a nice watch! I didn't end up buying one since my 220 still works just fine but it was fun to play with and super comfortable. Registration was completed online and was very simple. They have their own website with all the information for the race. I headed down the day before the race on Friday morning. The plan was to stop for Yuengling's beer (can't get it in Michigan), then get the tent set up for the weekend. The weather was projecting sunny weather the entire weekend and warm too. Too warm for a marathon, and crazy warm for an Ultra. 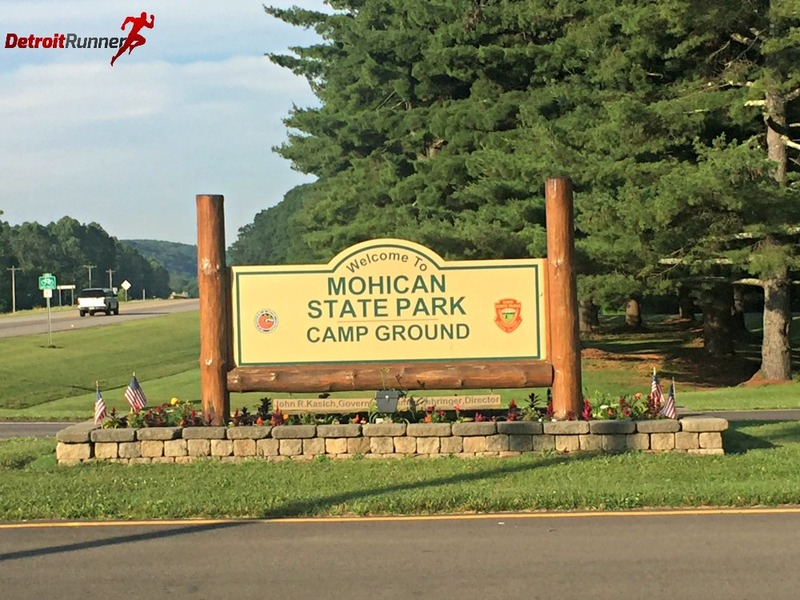 I stayed at Mohican State Park Camp Ground. I didn't know what to expect but it was a fantastic park. The start of the race was right in the park which made things easy in the morning since all I had to do was walk over to the start about a five minute walk from my site. No 4am starts for this guy. I had a site right on the Mohican river and people were tubing down it all day long. I got the tent up (first time with the new tent) and Dave and his girlfriend, Valerie, pulled up and were staying on my site as well. The park itself had showers, an awesome pool, the river and a camp store. Dave and I went over to packet pickup to get our packets. It's funny because I felt like I was signed up for a 5k given many were running the 50 mile and 100 mile races. Haha! 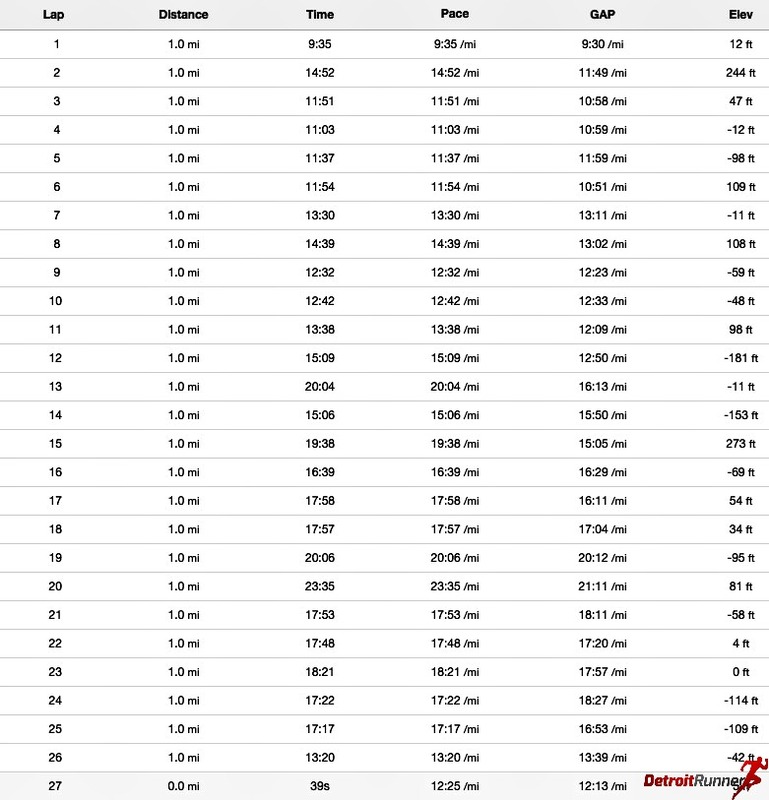 Packet pickup was really easy, as expected, given it's not a huge race. It's one of the things I love about doing trail race. Things are just much more simple. We went to a local restaurant just across the street from the finish line and they had a special for runners on pasta and pizza. We also met up with a couple other local runners, Dave and Beth who were running the 100 mile race. The course is mostly single track with hills like I never run in training, however, overall, it was not an extremely hard marathon course. It was just really hot and the heat took all my energy so I ended up walking half the race. I could not have imagined running the 50 or 100 mile races in those conditions. As you can see, there are a few hills on the course. 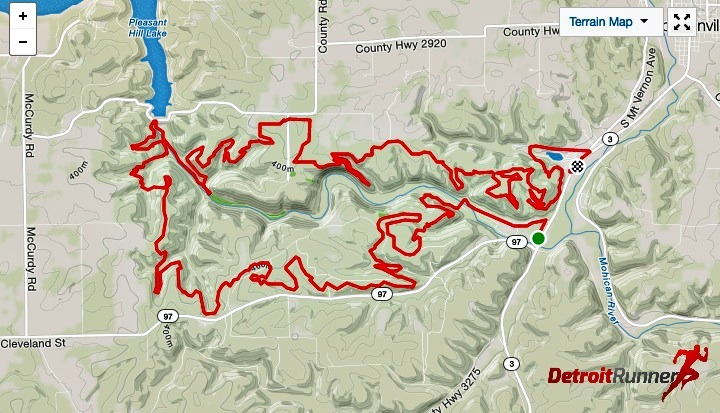 My Garmin showed 2,754 feet of gain. The first mile we actually ran back into the campground on the roads in order to get to the trail. The campground would also be a great place to just go for a run without even the race. It's a beautiful area. Then it was time to get onto the trails. I was kind of hoping for a gradual start to the race. And then we hit the trail! Holy cow it was hilly and technical right from the start. After a little while, I began to wonder what I had gotten myself into as you can see the hills below and how high the people ahead of me are. Below was one of the hilliest sections of the course and many were walking, including me. Soon we were back to running. With a few hundred runners, while I did run sometimes alone, much of the time there were runners around you. Regardless, the course was marked really well so there were no worries on getting lost. The race did an awesome job. I probably would have been freaking to run this at night not knowing the area. Just when we were running and getting our rhythm, more hills came! Haha. Some were not small either! We came to a portion of the trail where there were stairs and didn't know what to expect. As we got half way down the stairs, it opened up and there were rocks that were bigger than homes. It was a beautiful area and a little waterfall there too. We started running by the river which is always a nice place to run. Then it started getting a little muddier and we were having to jump over logs to stay on the trail. It was a crazy area to run and was one of my favorite parts of the entire course. We then started to climb out of the area and headed to the famous wall of tree roots. You actually climbed on the roots to get out of this area and back onto the trail. It was an amazing experience! Of course, it slowed you down (not the front runners) but was really exciting. As we continued, we came to a huge drop of stairs that we had to run. I'm happy that we didn't have to go up. I believe the other race here in April goes up this. Glad we were going down this! It was a pretty area near the river and I took a picture of a guy fishing in the river. We came to the covered bridge area which is really fun. I love seeing stuff like this in races. Then it was again back to the single track. The single track varied in that there were rocks, roots, and smooth surfaces. It was a great day to be in the woods......except for that heat! I even ran out of water between one of the aid stations just before the 20 mile mark. That's never happened but then I've never run in a marathon that hot either. The pines in this area were huge and the trail was nice and wide. I love the pine needles on the surface of the trail as they make for a great cushion when running. Soon we were back onto the roads and heading back to the finish. We had a little jaunt on the sidewalk, crossed under the road and made our way to the finish line which is where packet pick up was as well. From the finish, I had to walk back about a mile to my campsite since the race does not have a shuttle. It was actually a nice recovery walk back but might not have been so fun had it been raining. You could have also stayed at Mohican Adventures where most runners stayed but that would have meant about a mile walk to the start. As would be expected for a trail Ultra marathon, the race aid stations were not like regular marathon races. They are fully stocked with everything you can think of for the ultra runners. They were very organized and ready for the runners as they came in. They also were cheering at each aid station. There is not a ton of spectators so keep that in mind if that is what you are looking for. I didn't get many pictures of the aid stations but they were spread out about every 5 miles. Overall, I finished, and given the heat I was happy to just finish. It was my personal worst time but I didn't care. 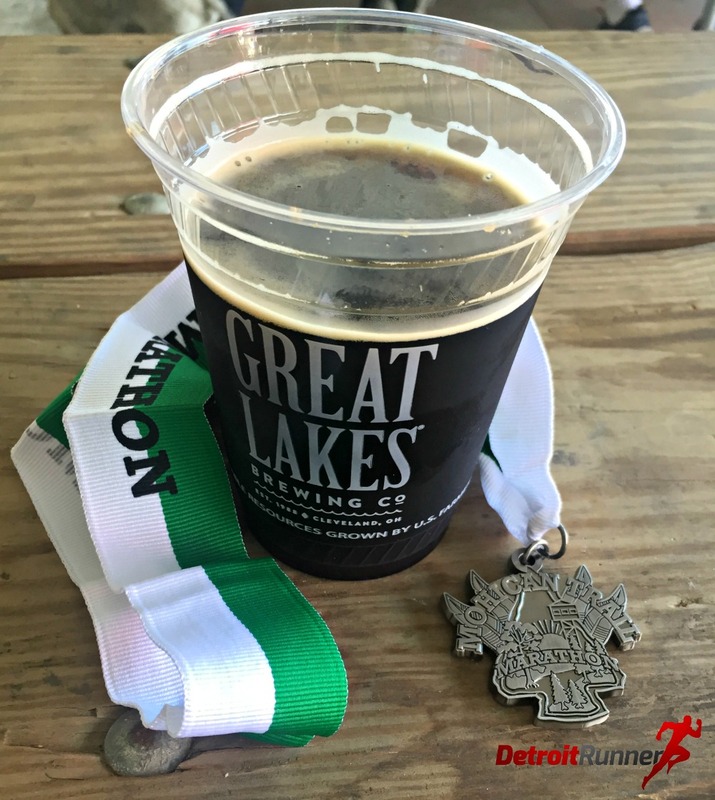 The race had free Great Lake Brewing beer at the finish and you could also buy food from food trucks as well. I got my free beer and ate some food before I walked back to my campsite to relax the rest of the day. For your entry fee, you received a well marked course with aid stations. You also received a custom race bib with your name on it. 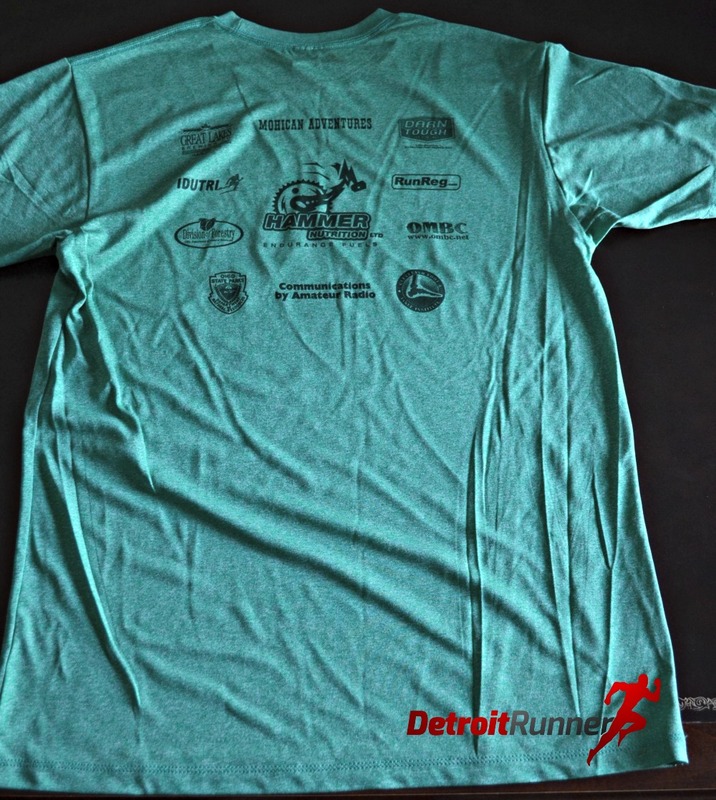 You received a tech race shirt. This is a newer style tech shirt some of the races are now offering and it's really nice. You received a metal for finishing. The 50 milers received larger medals and the 100 milers received belt buckles. It's got a really nice design to it too! You received free beer at the finish line. Not only is it free but it's Great Lakes Brewing which is fantastic beer. The organization was good. They have a website that had most of the information you needed. The park didn't really know where the start was when we asked initially but then when we asked again, they knew where it was. It was easy to find both the start and packet pickup. Packet pickup was organized and they could answer all your questions. The City is small so this is primarily a race to do to explore the trails although it's a perfect camping vacation since that is primarily what you do there. There were no hotels very close. Overall, it was a great experience. The area is just beautiful and it's an area I'd love to go back again and just run some trails on vacation. Having the river at the campground was nice and the pool is great especially if you are bringing the family. I stayed the entire weekend since it was so nice. I would definitely recommend the race. This also looks like an awesome Ultra marathon although I won't be running 50 or 100 miles anytime soon. This looks so tough but so awesome!! Going on my bucket list for sure!!! It looks very very tough. Great recap and wonderful photos. Congrats. Yet another awesome race review. Thanks for another idea; adding it to the list. I did both the Two Hearted half and the Run Woodstock 50K this year after reading your reviews and loved both. Thanks!